Fifty horses have been removed from a property in Texas under the authority of the Smith County District Attorney's Office. Investigators at the Texas property. An investigator with the office served a seizure warrant on the owner of the horses on Tuesday night, allowing the removal of the horses from the Lindale property the next day. The Humane Society of the United States (HSUS), SPCA of East Texas and Humane Society of North Texas were involved in the operation. Many of the horses were severely emaciated and showed signs of neglect, the HSUS said. "These horses may have been struggling to survive for quite some time, but now thanks to everyone involved in this rescue they will receive the care they so desperately need," said Nicole Paquette, Texas senior state director for the HSUS. "It is the responsibility of every horse owner to provide humane, responsible care for their horses at all stages of their lives." Rescuers on the 70-acre property found mostly quarter horse-types. 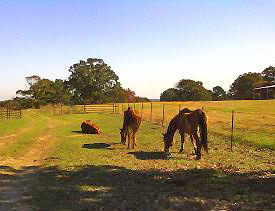 The group also included several yearlings and pregnant mares. The HSUS said many of the horses were emaciated and suffering from a variety of medical ailments, including overgrown hooves and parasite infestation. Rescuers also found several dead horses and equine skeletons on the scene. Local law enforcement was alerted to the situation by the SPCA of East Texas, which then called the HSUS to act as the lead animal welfare organisation in the rescue. Invaluable sheltering and logistics help was also provided by Smith County Sheriff's Department and the Texas State Fairgrounds, the HSUS said. The horses have been taken to a temporary shelter, where they will be checked by a team of veterinarians and given any necessary immediate medical care. The horses will be cared for at the shelter until their custody is determined. 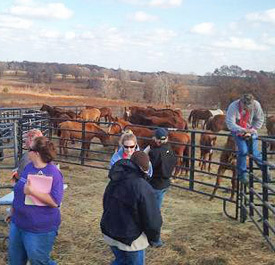 Meanwhile, in Arkansas, 116 horses seized on a farm west of Viola, in Fulton County, have been ferried to a disused barn that rescuers have been preparing for their arrival. The barn took three days to prepare, after which the horses were systematically loaded on to trailers and taken the 40 miles west to Mountain Home, where their temporary home is located. They are expected to be housed there for 30 to 60 days. The horses were initially secured by the Fulton County Sheriff's Department, joined by officials from the Humane Society of the United States, the American Society for the Prevention of Cruelty to Animals and the Arkansas Livestock and Poultry Commission.